When Choosing EverEdge consider that it is available in metre lengths in different depths and finishes. The Galvanised and Powder Coated finish is available in three different depths, 75mm (colours are black, brown, and silver), 100mm (colours are black and brown) and 125mm (colours are black and brown). In the Cor-Ten (rust) finish EverEdge is available in the 100mm and 125mm depths. 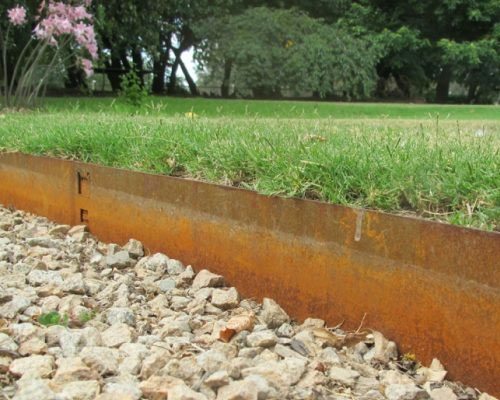 The galvanised and powder coated colours in black and brown are designed to be unobtrusive and give the impression that the soil is holding a nice neat edge. The Cor-Ten Steel makes more of a feature of the garden edges. Generally the 75 mm depth is ideal for edging paths or driveways (where no grass is involved) whilst the 100 mm and 125 mm depths are used for edging lawns and flower beds particularly where grass runners are involved. 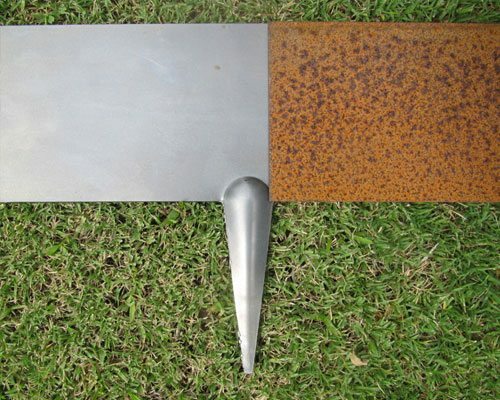 With most Australian lawns being created with grasses that send our runners (couch, kikuyu, buffalo, etc) it is very important to create an underground barrier to control the spread of the lawn into paths or beds. When about 30mm of the actual edge as well as the spikes is hammered into the ground this creates an underground barrier that will stop at least 80% of the runners (nothing will stop the few determined ones that go metres deep and cross under roads but at least they can be easily spotted and weeded or sprayed out). 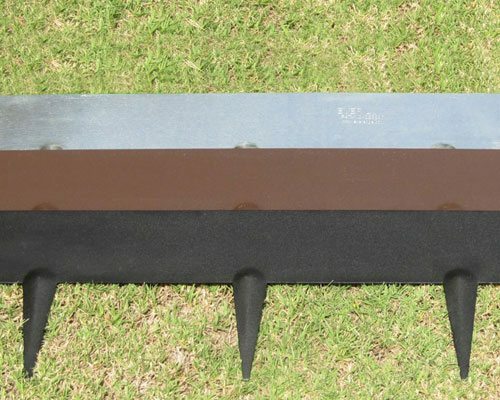 The 100mm and 125mm depths should therefore be used where control of grass runners is required. For more information please Contact Us or visit one of our Stockists.